Why not in the garden? is a short-term, mobile and changeable, accessible and versatile pop-up. It is a public garden on wheels and, started from dawn on Monday 13th April, with a stage performance, plants and flowers were added throughout the morning. The Why not in the garden? design. 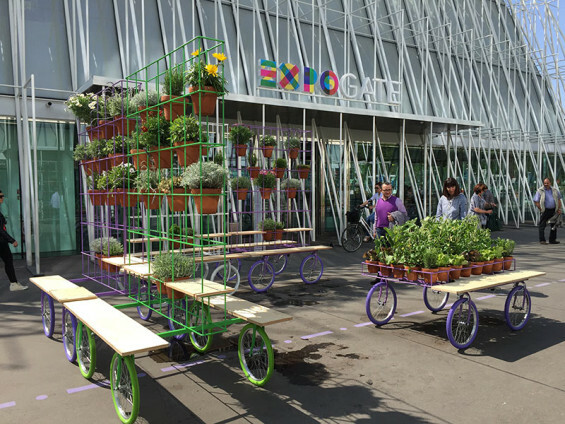 What makes this installation different is green on wheels, a module in two versions. 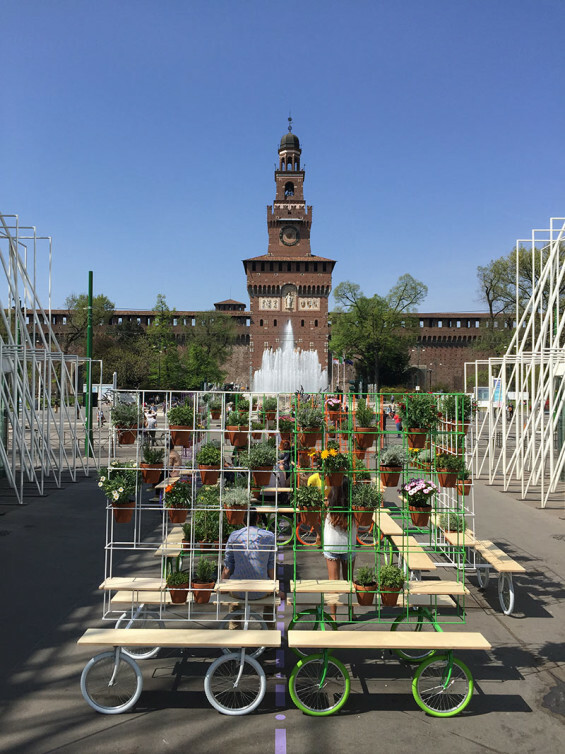 The vertical element is a light iron structure painted in bright colours with wooden benches and espaliers for the pots of plants, while the horizontal element is a an iron platform-flower bed. 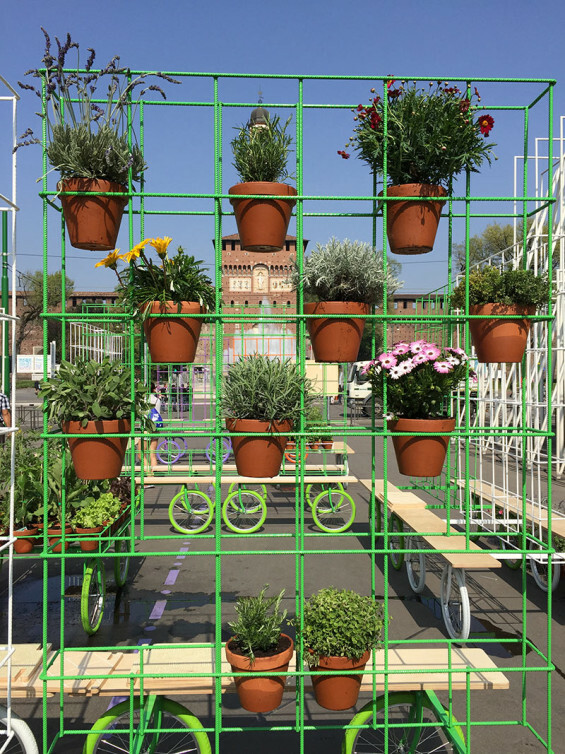 The modules are all mounted on bicycle tires painted the same colours as the structure which holds aromatic, garden and flowering plants. The artwork on the flooring traces the different layouts of Why not in the garden? 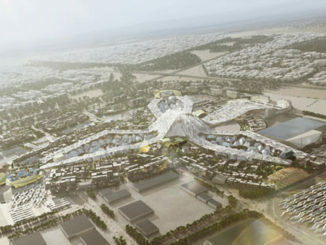 during the time it will be at the Expo Gate, showing what will be happening there. 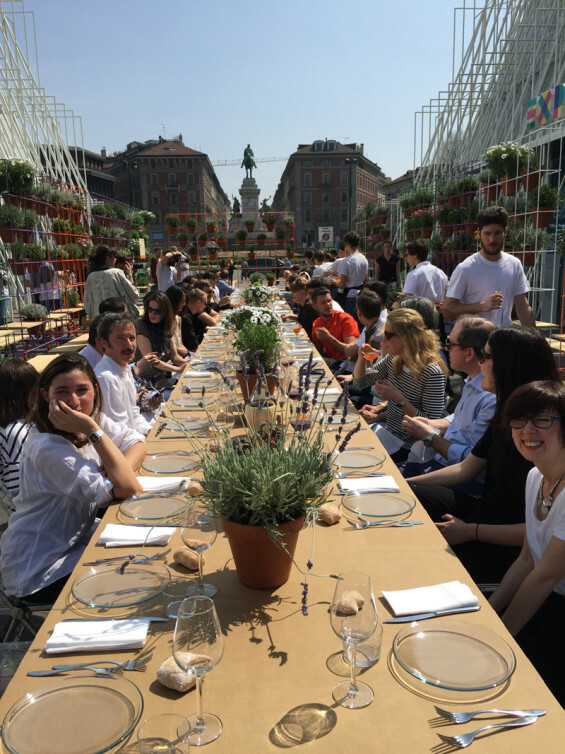 A 40-metre-long cardboard table will run the length of the square for the late-night spaghetti party on Thursday 16 April. 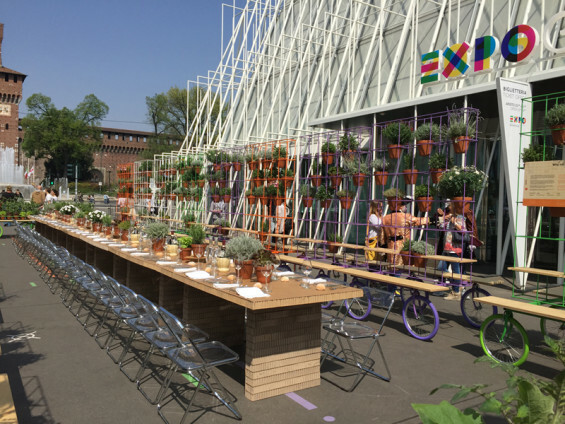 The project has been masterminded and realized for Expo Gate by the A4A Rivolta Savioni Architetti studio which is well-known for green installations that transform the urban scene like the quantomais and bosco in corso installations designed for the Expo Gate in August and October 2014. 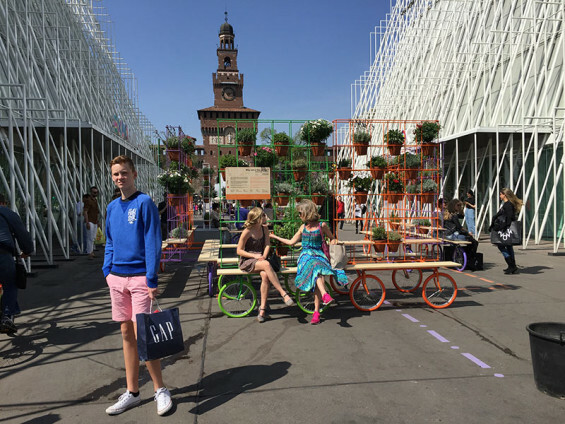 Over the ten days on the square it will constantly change shape welcoming locals, tourists and visitors to the Salone del Mobile (the International Furniture Exhibition). 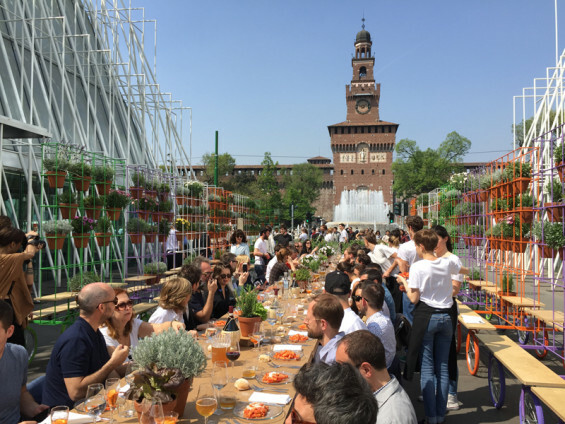 The most surprising transformations will take place during the Fuorisalone, hosting a series of free events featuring food, from an afternoon snack for children to an urban picnic and from a vintage cocktail to a moonlit spaghetti party. And on the last day Why not in the garden? becomes a take-away garden for charity: on Friday 24th April the 450 plants will be put on sale, and the money raised will go to the humanitarian association Link for Aid which helps the underprivileged and poor children in Myanmar and Cambodia. Why not in the garden? 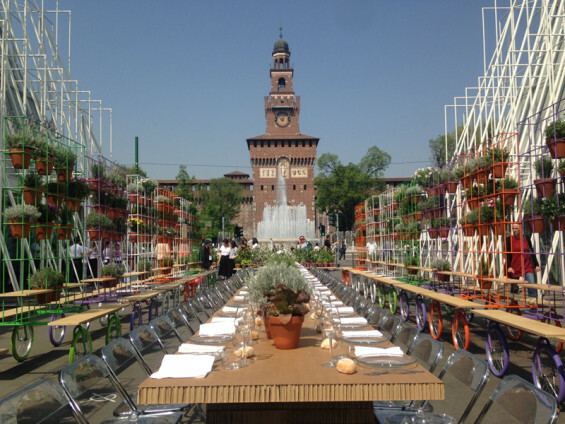 is part of Il Progetto del Cibo (the Food Project), a series of Expo Gate events planned for the month of April – leading up to the inauguration of Expo Milano 2015, and at a time when the city is the centre of world attention for the Salone Internazionale del Mobile – that are an exciting mix of food, design and architecture. Why not in the garden? 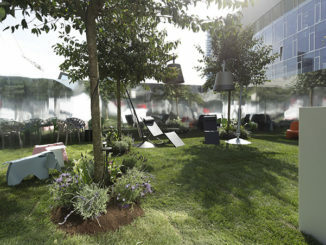 is a place to chill out, a rendezvous, a public space open on 13 to 24 April.